In Sales, we’re always dealing with moving parts: working various leads, communicating with multiple stakeholders, coordinating opportunities and deals of all different stages and using multiple tools to do so. With so much going on, it’s easy to lose track of the big picture and miss your team’s sales or pipeline quota goals. Create documents on-the-go from your smartphone or tablet using the PandaDoc mobile app (beta). Verify document authenticity with the new blockchain integration. 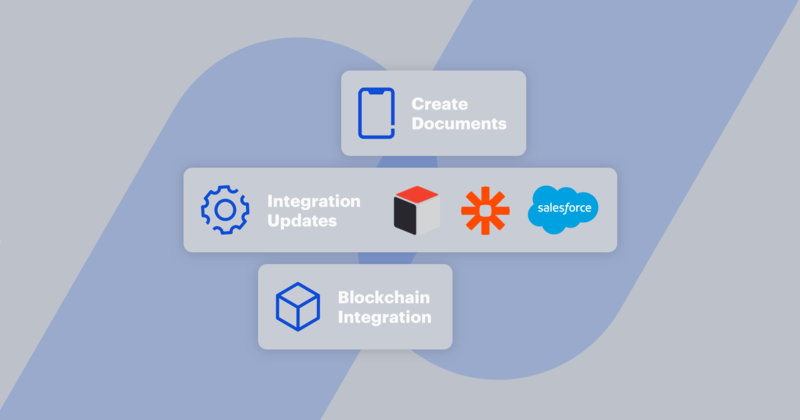 Automate more complex workflows with integration updates for Salesforce, Sugar CRM, and Zapier. We often hear from our customers how important it is to capitalize on a sales meeting by sending a proposal immediately, even when you’re out of the office. With the updated PandaDoc mobile app, you can generate and edit documents on any mobile device. 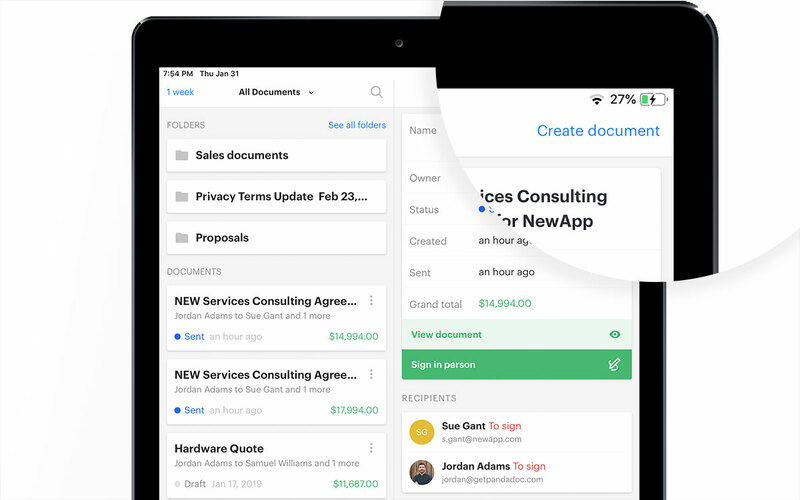 In just a few clicks, you can have a new proposal or contract in your customer’s inbox or be ready for in-person signing. Annie, an Account Executive, spends a lot of her time out of the office meeting with her customers. On her way to meet with a customer, she gets a call asking her to send the contract for legal review prior to her arrival. Unfortunately, she’s already in the car and doesn’t have time to go back to the office and prepare the contract. But wait! She doesn’t need her laptop to send the agreement! Annie opens the PandaDoc mobile app on her phone, finds the Template for contracts, adds the customer details, enters the deal data, and sends a customized contract within minutes of receiving the call. When Annie arrives at the meeting, the customer has already reviewed the contract and is ready to sign the deal right on the spot. Test out the new app for yourself! All you need is a PandaDoc account the latest version of the PandaDoc mobile app on your mobile device from the Google Play or App Store. If you don’t have a PandaDoc account yet, sign up for a 14-day free trial, then log into the mobile app. Learn more about our mobile app in this FAQ article. Digital documents are subject to certain risks like fraud and unauthorized edits. Leo, the Head of Legal, is worried about an increase in the number of cases where his team needs to prove a digital document’s authenticity. In a recent case, a supplier modified the contract terms themselves – a change which could cost the company thousands of dollars. How can PandaDoc help Leo and his team identify those document modifications to protect their business? Luckily for Leo, we recently announced our new “Protected PDF” technology which verifies that signed documents haven’t been edited. Today, we’re introducing an even more advanced method of protection: the new Ethereum blockchain integration for verifying documents signed with PandaDoc. The blockchain integration is a new, sophisticated way to check whether a document existed on a specific date and whether the signed version has been altered or not. The records for the document stored in the blockchain cannot be changed by any party. The best part is that you don’t need to access the document content to see the verification records, meaning this method can be used for business contracts, legal and financial documents without disclosing private and sensitive data. Let’s chat if you’re interested in the PandaDoc blockchain integration for verifying proof-of-existence and the integrity of signed documents. For companies with several teams and departments working out of Salesforce: we’ve improved our 2-way sync capabilities. Now, 2-way sync triggers can be enabled for multiple workspaces so that every team can benefit from having their data up-to-date across their tools. Automatically saving document status backlogs and PDF copies to Salesforce Files (previously “Notes and Attachments”) for quick access. 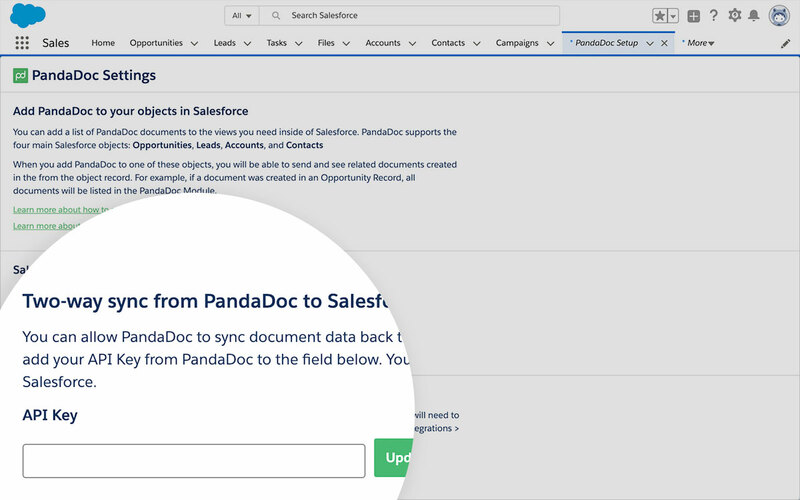 Automatically updating the Products associated with a Salesforce opportunity when pricing in a PandaDoc quote is changed. Get the latest Salesforce integration version from our Salesforce AppExchange listing to access these new capabilities. Let us know if you need help setting up 2-way sync for your Salesforce integration or check out this FAQ article for a step-by-step guide. With PandaDoc and Zapier, you can set up trackable end-to-end sales workflows. We’ve added all document statuses to the “Document Status Changed” Zapier trigger so that you can create custom document workflows for any scenario. Trigger actions or create next steps in other apps when your PandaDoc documents move to “waiting for approval” or “approved,” “rejected”, “expired,” or “waiting for payment” statuses. Another productivity tip is to use document statuses for setting up auto-reminders or project to-do items for your colleagues and customers. For example: if a document is waiting for approval, send an auto-reminder through Gmail or via a Slack message. Set up the new zaps now in your Zapier account. If you have not enabled Zapier for PandaDoc, check our how-to guide. This update is for all you Sugar CRM cloud users: PandaDoc now supports the latest Sugar CRM version. Sugar CRM is known for its intuitive customer experience and great customization capabilities. No action required – the latest Sugar CRM updates (Sugar Professional 8.3.0) will apply automatically. With the PandaDoc integration, sales teams save tons of time by using flawless end-to-end workflows without leaving Sugar CRM. Create, send, sign, and track proposals, and contracts – all from within SugarCRM. Reduce manual tasks and errors by automatically pushing contact information, product and pricing details, and other CRM data into your documents. Learn more about the Sugar CRM integration. Give the integration a try today by logging into your PandaDoc account or starting a free 14-day trial. We’re always working on more features and updates, so vote for product ideas in our Idea Portal and let us know how you think we can improve PandaDoc!